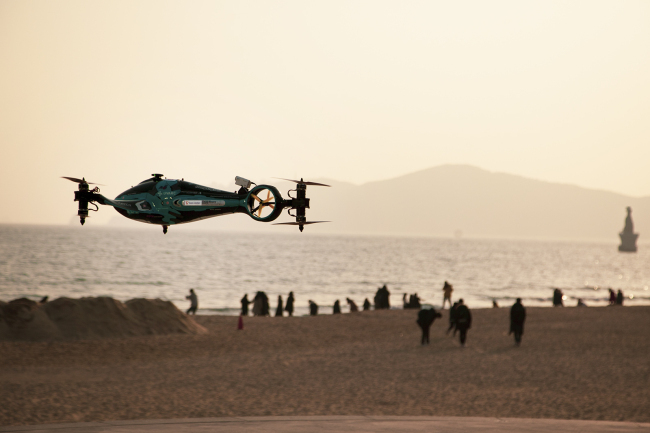 The South Korean government on Thursday kicked off Drone Show Korea 2019 in the southern port city of Busan, with some 100 firms showcasing their latest drones and related technologies. The Ministry of Trade, Industry and Energy said the annual event, which marks the fourth of its kind, is the largest drone-related convention in Asia. It will run for three days through Saturday. South Korea's top mobile carrier SK Telecom Co. took part in the event, unveiling a new communication service that is capable of livestreaming videos shot by drones through a fifth-generation network. This Is Engineering Inc. displayed a drone controller that can be activated easily with only one hand. Established in 2016, the startup raised 7 billion won ($6.2 million) in investments last year. Doosan Mobility Innovation announced it will mass-produce a drone that can run on hydrogen fuel cells. The firm said if drones with lithium batteries can fly 20 to 30 minutes, those with hydrogen fuel cells can stay aloft for up to 2 hours. Other local organizations and research centers also shared the latest achievements in the drone industry, including delivery drones as well as those for military purposes. The ministry said South Korean plans to provide various support to drone firms to foster the industry. Under the so-called regulatory sandbox program, which centers on encouraging local companies to seek innovation and new opportunities by reducing regulations, the ministry said local firms will be given more leeway as long as safety is guaranteed.